No party set-up is complete without chairs and tables to ensure the comfort of your guests. 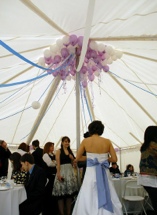 At Parliament Parties, we offer different types of affordable rental chairs, tables, and coverings for your party needs. 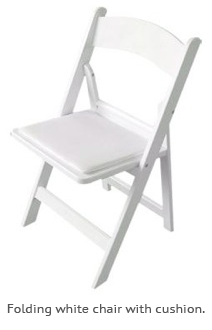 Quick delivery, assembly, and comfort are guaranteed with these cushioned white chairs that will effortlessly complement your all-white set-up so you won't have to pay extra for linen covers. 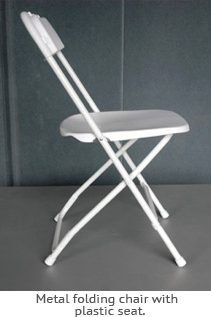 Our metal folding chairs are fairly lightweight , slim, and sturdy. They are excellent space-savers, especially when you want to maximize floor space within your tent. 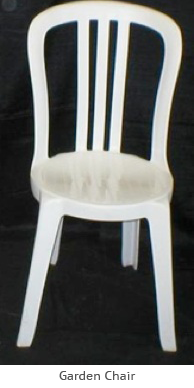 Garden chairs are also a fine choice for almost any kind of party set-up. Dressed with a linen cover, these simple chairs turn to elegant additions to your event setting, instantly. Our 6-foot rectangular tables can seat up to six people, while longer 8-foot tables can accommodate eight. 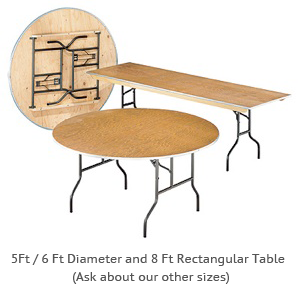 Our 5-foot round tables can seat 8 to 10 guests. 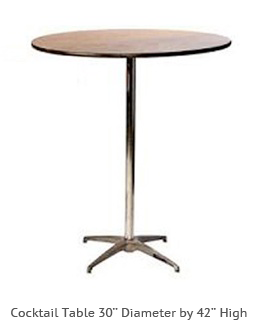 We also have 30"x42" high round tables for special entrees and cocktails. If you wish to add a bar area to your party set-up, you may also rent plastic or wooden bar counters along with bar stools from us!